Haitians have seen their fair share of dictators and despots since their country gained its independence in 1804. But for the 1 million Haitians currently living abroad, one dynasty looms above the rest. For nearly three decades, Haiti was ruled by the notorious Duvaliers—first by Francois “Papa Doc” Duvalier and then by his son, Jean-Claude “Baby Doc.” That era came to a close in early October, when Baby Doc died in Haiti at the age of 63. He had been facing charges of corruption and human rights abuse. Baby Doc’s death has revived memories of repression and violence throughout Haiti. But one of his most significant legacies lies outside the country—in the flourishing Haitian Diaspora that fled the poverty and repression of the Duvalier era. Papa Doc ruled Haiti with terror and impunity from 1957 until his death in 1971. With help from the Tontons Macoutes—a secret police force that took its name from a folk bogeyman who devours misbehaving children—Papa Doc presided over the murders of an estimated 30,000 people. Thousands of others simply disappeared or were imprisoned at the notorious Fort Dimanche, a prison known for torture, mutilation, and death. When Papa Doc died, his youngest and only son, Jean-Claude “Baby Doc,” became a teenage dictator at the age of 19. Baby Doc lived an extravagant lifestyle as the president of Haiti, driving luxury cars while his wife pampered herself with fur coats. But beneath the flashy exterior, Papa Doc’s legacy of terror continued. Corruption, imprisonment, and repression remained staples in Haiti’s government during Baby Doc’s 15-year rule. And so did abject poverty, with over half of the population living on less than $1.25 a day in the early 1980s. The lack of jobs in rural areas caused a massive influx of workers into Port-au-Prince, where they took low-paying factory jobs with foreign companies lured by Baby Doc’s tax incentives. Paying low wages and benefiting from cushy tax breaks, these factories did little to improve Haiti’s economy. Instead, expansive slums spread out around Port-au-Prince, putting immense pressure on the weak Haitian infrastructure. Prospects for economic mobility were bleak. A staunch anti-communist, Baby Doc managed to restore Haiti’s relationship with the United States—which had been strained during his father’s rule—by releasing a few political prisoners and loosening restrictions on the press, earning his otherwise oppressive regime support from the Reagan administration. But while the U.S. government was supporting Baby Doc, Haitians were fleeing to the United States by the thousands. Initially the numbers were modest: In 1960, about 5,000 Haitians were living in the United States. But in the late 1970s, the flow quickened into a torrent. Approximately 220,000 Haitians immigrated to the United States between 1960 and 1990, including 25,000 in 1980 alone. Today over 600,000 Haitian-born people call the United States home. Haitian migration started making U.S. headlines when shoddily constructed boats filled with people began to wash up on the shores of Florida. The trip was perilous and often deadly, and because the U.S. policy on boat migrants was to accept Cubans but not Haitians, there was always a chance of being sent back. However, not everyone left by boat. Wealthier and more educated Haitians who had the means to purchase plane tickets became known as the “Boeing people”—a sharp contrast to the “boat people” arriving by sea. But for Boeing people and boat people alike, settlement patterns were quite similar. Many stayed right where they arrived in Miami, transforming neighborhoods into their own little enclaves. New York City—and in particular Brooklyn and Queens—also attracted a high density of Haitian migrants, as did Boston and northern New Jersey. Haitians, however, were not welcomed with open arms. Though they fled brutal repression in Haiti, the U.S. government considered them “economic migrants,” making it difficult to secure refugee status. 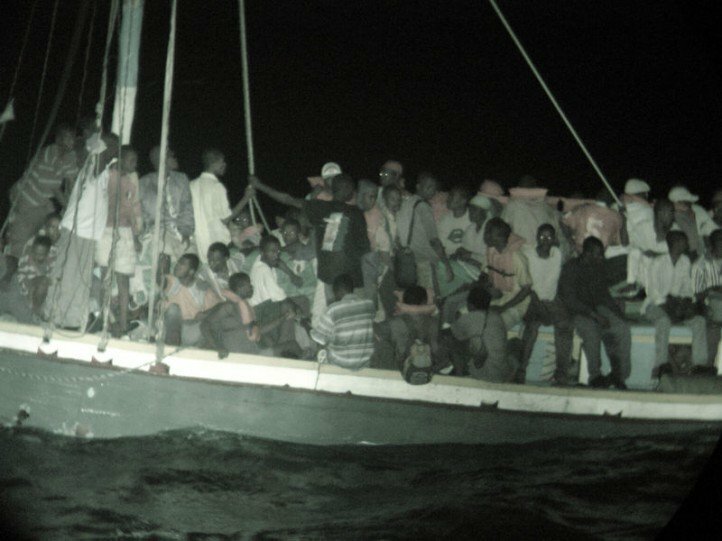 Haitian migrants also suffered from racism and dangerous social stigmas. In the 1980s, for example, the Center for Disease Control listed Haitians alongside homosexuals, hemophiliacs, and heroin users as key carriers of HIV. This malicious claim reared its ugly head again in 1990, when the Food and Drug Administration (FDA) restricted Haitians (and Sub-Saharan Africans) from donating blood. In a sign of the growing strength of the community, an estimated 50,000 Haitians, sub-Saharan Africans, and their allies marched on the Brooklyn Bridge to protest the FDA that year. While the Diaspora struggled to dispel debilitating myths and build new lives abroad, the Haiti they left behind continued to suffer. The brain drain that began in the 1970s and 1980s hollowed out the country’s labor force, with some 70 percent of Haiti’s skilled workers still living abroad today. A shortage of teachers, doctors, scientists, and engineers has left a huge hole in the economy and slowed down the country’s development. Haiti remains the poorest country in the Western hemisphere. Yet in their absence, expatriate Haitians have become the country’s most valuable resource. The $1.5-1.8 billion they send home each year is more than half the national income of Haiti, and they have proven a crucial source of emergency funds in times of disaster. After the 2010 Port-au-Prince earthquake, which killed an estimated 300,000 people and destroyed 70 percent of buildings in the capital city, U.S.-based Haitian groups sent doctors and nurses to aid in the recovery process, along with an additional $360 million in remittances to family and friends struggling to restart their lives. A little over a year after the earthquake, Haiti’s political scene was struck by a quake of its own when Baby Doc, who had been deposed in 1986, returned to the country after over two decades of exile in France. Some speculated that his return was politically motivated. Others guessed that because of his sickly appearance, he had returned to die. Baby Doc himself claimed that he returned because he wanted to help in the reconstruction process. His return was met with mixed reaction. Duvalier supporters, like current president Michel Martelly, welcomed him home. But expatriate Haitians who had suffered under his regime felt anger and jealousy that he was in Haiti and they were not: He was the reason they left, and now he was back on Haitian soil—a free man, but hopefully not for long. The Haitian Diaspora and their children, however, saw Baby Doc’s death differently. Patrick Gaspard, a child of Haitian emigrants who is now the U.S. ambassador to South Africa, recalled “the look in my mother’s eyes when she talks about her brother Joel who was disappeared by that dictator.” Other Haitians called in to U.S. radio stations to demand an investigation of the deaths and disappearances during the Baby Doc years. Though they will never see Baby Doc imprisoned for his crimes, human rights groups in Haiti remain committed to moving forward with the case. Perhaps sensing this resolve, Martelly opted not to throw the deceased dictator a state funeral. The Duvalier era remains an open wound in Haitian history. Baby Doc leaves behind two surviving children, an ex-wife, a Haiti still struggling to recover, and a 1-million-strong Diaspora—who remain Haitian to their core, but will likely never return home. Nathalie Baptiste is a Haitian-American who lives in the Washington, D.C. area. She holds a BA and MA in International Studies and writes about Latin America and the Caribbean.